Contents: A.P. Brief, J.P. Walsh, Series Foreword. K. Leung, Foreword. J.S. Chhokar, F.C. Brodbeck, R.J. House, Introduction. J.S. Chhokar, F.C. Brodbeck, R.J. House, Methodology. Part I: Nordic Europe Cluster. Cluster Introduction. Map. I. Holmberg, S. kerblom, "Primus inter pares":Leadership and Culture in Sweden. M. Lindell, C. Sigfrids, Culture and Leadership in Finland. Part II: Germanic Europe Cluster. Cluster Introduction. Map. G. Reber, E. Szabo, Culture and Leadership in Austria. F.C. Brodbeck, M. Frese, Societal Culture and Leadership in Germany. H. Thierry, D.N. den Hartog, P.L. Koopman, C.P.M. Wilderom, Culture and Leadership in a Flat Country: The Case of The Netherlands. J. Weibler, R. Wunderer,Leadership and Culture in Switzerland-Theoretical and Empirical Findings. Part III: Anglo Cluster. Cluster Introduction. Map. N.M. Ashkanasy,The Australian Enigma. S. Booth, Inspirational Variations? Culture and Leadership in England. M.A. Keating, G.S. Martin, Leadership and Culture in the Republic of Ireland. J.C. Kennedy, Leadership and Culture in New Zealand. L.A.E. Booysen, M.W. van Wyk,Culture and Leadership in South Africa. M.H. Hoppe, R.S. Bhagat,Leadership in the United States of America: The Leader as Cultural Hero. Part IV: Latin Europe Cluster. Cluster Introduction. Map. P. Castel, M. Deneire, A. Kurc, L. Marie-Fran‡oise, C.A. Leeds, Universalism and Exceptionalism: French Business Leadership. J.C. Jesuino, Leadership and Culture in Portugal. J.J. O'Connell, J.M. Prieto, C. Gutierrez,Managerial Culture and Leadership in Spain. Part V: Latin America Cluster. Cluster Introduction. Map. C. Altschul, M. Altschul, M. L¢pez, M.M. Preziosa, F. Ruffolo, A Crisis of Guidance: Argentine Leadership Icons and Middle Managers Adaptive Responses. E. Ogliastri, Colombia: The Human Relations Side of Enterprise. J.P. Howell, J. DelaCerda, S.M. Mart¡nez, J.A. Bautista, J. Ortiz, L. Prieto, P. Dorfman, Societal Culture and Leadership in Mexico. Part VI: Eastern Europe. Cluster Introduction. Map. N. Papalexandris,Greece: From Ancient Myths to Modern Realities. M.V. Grachev, N.G. Rogovsky, B.V. Rakitski,Leadership and Culture in Russia: The Case of Transitional Economy. Part VII: Middle East Cluster. Cluster Introduction. Map. H. Kabasakal, M. Bodur, Leadership and Culture in Turkey: A Multi-faceted Phenomenon. Part VIII: Confucian Asia Cluster. Cluster Introduction. Map. P.P. Fu, R. Wu, Y. Yang, J. Ye, Chinese Culture and Leadership in China. I.H-s. Chow, Culture and Leadership Behaviors in Hong Kong. J. Li, P.M. Ngin, A.C.Y. Teo, Culture and Leadership in Singapore: Combination of the East and the West. Part IX: Southern Asia Cluster. Cluster Introduction. Map. J.S. Chhokar,India: Diversity and Complexity in Action. Part X: Sub-Saharan Africa. Cluster Introduction. Map. F.C. Brodbeck, J.S. 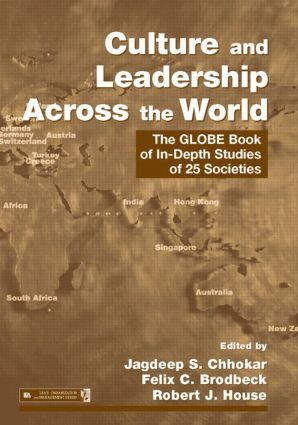 Chhokar, R.J. House, Culture and Leadership in 25 Societies: Integration, Conclusions, and Future Directions.